Welcome friends! 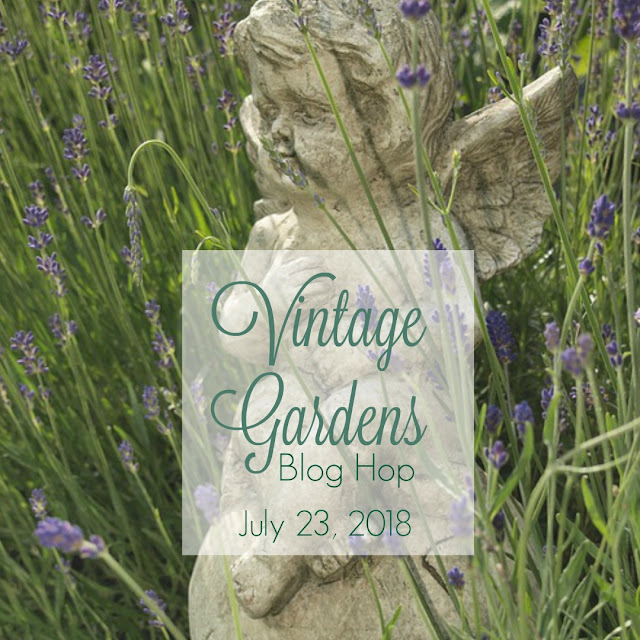 Today I'm joining a few other bloggers, organized by Amber at Follow the Yellow Brick Home, to share spots in our gardens that incorporate vintage items or items with character. You know, those things you include in the garden that show your personality. If you just popped over here from Petite Haus then welcome! If you are a regular reader, I sure am glad you are here. Let me start on the porch with my garden cart. 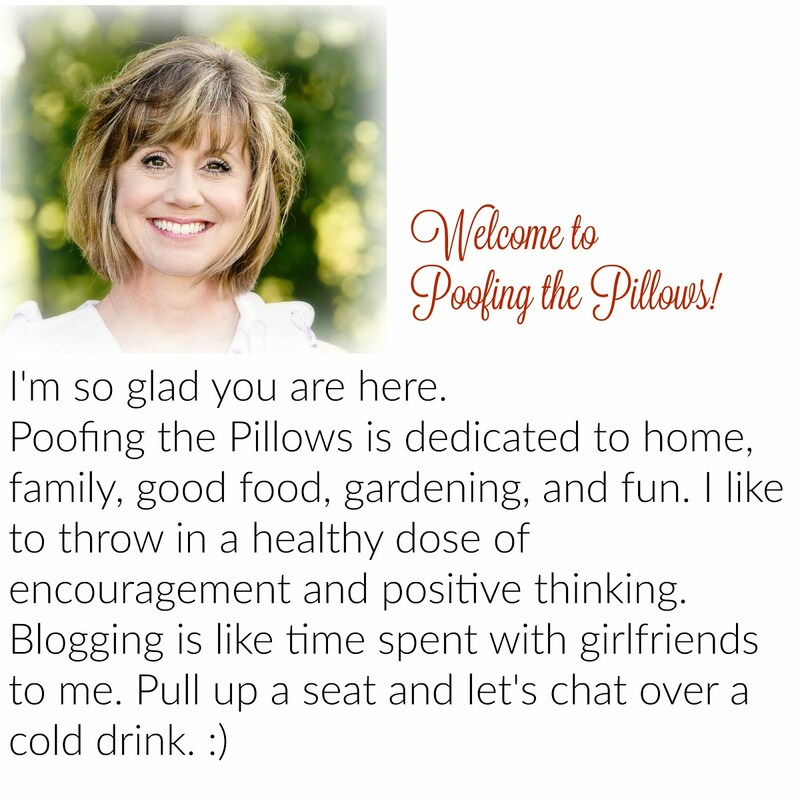 If you've been reading Poofing the Pillows very long, you know this is a favorite of mine! I bought this cart in about 2000 when we were building a home in Oklahoma. I love filling this cart in each season and it has had many looks over the years. The cart is bent now and a little worse for the wear but it's still a favorite piece. Let me show you a few ways we've enjoyed this cart over the years. Last summer, we did a DIY fountain in the cart and loved having it on the front porch. You might have one of these small little John Deere tractors at your house. I've seen lots of them over the years. This one was passed down from my husband's side of the family but I'm pretty sure my parents used to have one too. Seems like artistic people made these with tractor parts. Am I right about that? The plant surrounding this little tractor is Ice Plant. I think! Ice Plant is what I wanted and that's how it was labeled but the flowers do not match what I see online so who knows. It's a succulent plant that is doing great in our flower beds. It is supposed to be perennial and spread. So far it's thriving. She's not vintage but our little Belle or Bellhopper, as I often call her, adds lots of character and fun to our gardens. She's always with us and the garden is as much hers as it is ours! Her favorite thing to do is to look for toads. She doesn't grab them but she chases relentlessly. There's nothing like a little dog to make you laugh! 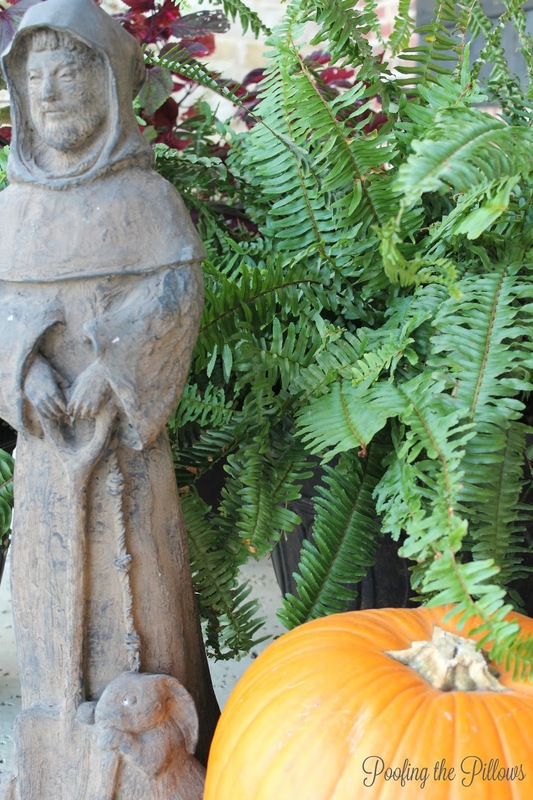 A beautiful afternoon with my mom at the Dallas Arboretum comes to mind every time I look at St. Fiacre in the garden. You can call him Saint Frances if you'd like but the tag called him Saint Fiacre so I stick with that. He was the patron saint of growers of vegetables and gardeners in general. He has also had a special place in our garden over the years. He's in our front flower bed right in the perfect spot to greet visitors. I have my eyes on something new that I'd like to incorporate in our garden but finding it on sale is an absolute must!! The Mrs. Powers tuteur from MacKenzie-Childs is on my watch list. I will find it on sale and I will get it sooner or later. Isn't it fun? Have you ever stopped to think that the perfectly placed statue or pot of flowers can turn a spot in the garden into a destination? 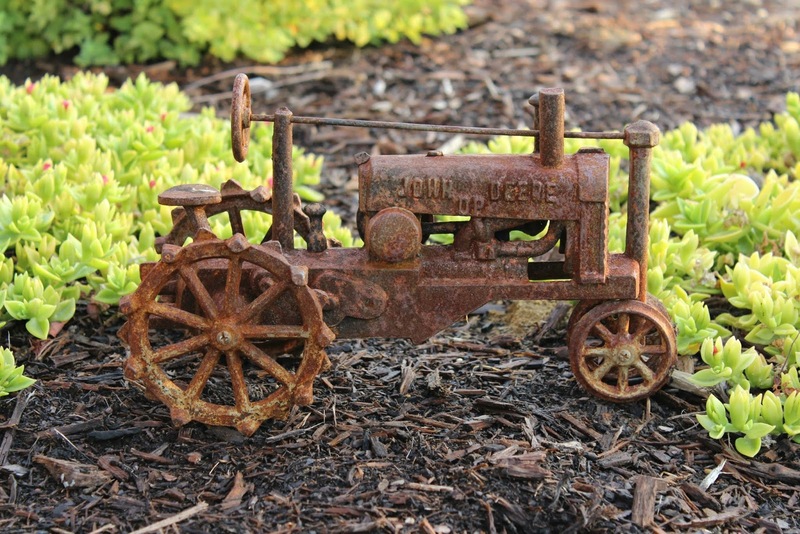 Do you have items in your garden that evoke special memories? Thank you for following along with my garden ramblings today. Please pop over to visit these talented gardeners as they share some vintage love in their gardens. Next in line is the sweet and talented Carol at Art and Sand. Be sure to come back Friday for the Garden Party link up too! Stacey, I love the cart and the many ways you have used it through the years. The MKC tuteurs are fabulous and what a a showpiece they would be. I enjoyed visiting with you and Belle! Stacey...I love it all! That little tractor is just great! 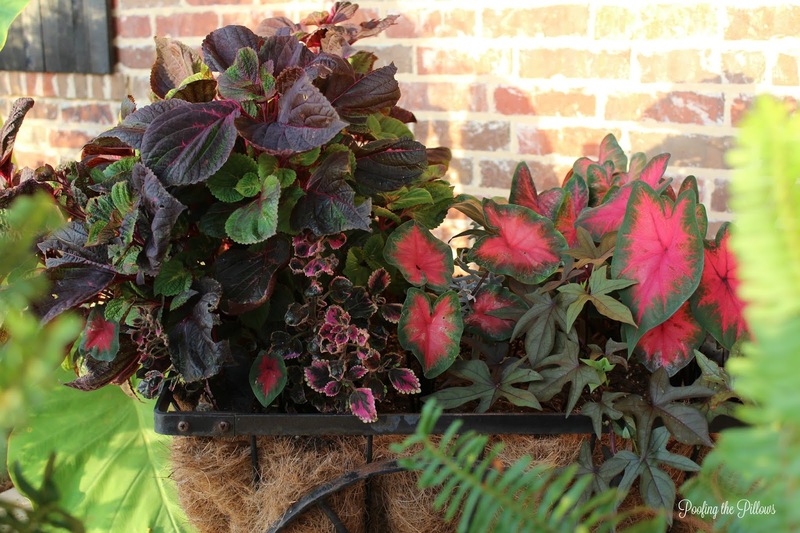 The coal bucket is such a pretty color and perfect for flowers. I love your saint too! I have a saint statue around front, he will probably make an appearance in the fall garden tour. You are definitely agree that the right garden accessories can create a "destination" in the garden. Your spaces look beautiful! Thanks so much for joining us for the hop! So tired...hope you can decipher my typos! Stacey, your garden is amazing! I love the little John Deere tractor! And I love how you used your coal bucket! I have a coal bucket that isn't doing anything right now, and now I have some inspiration to put it to good use! So happy to be on the hop with you! Good morning ,Stacey. Love your little cart, your John Deere tractor, your coal bucket planter and your MKC tuteurs idea! Oh, and your" Saint Fiacre" is one of the nicest I have seen. How nice to go to the Dallas Arboretum with your Mom. I am going to miss going there so much since my son has moved to San Antonio. That was sweet of your husband to accompany you at an antique show! Enjoyed your tour this morning. Stacey it is all those little touches that make your garden so special. I've never seen the tractor before but it is so cute and really adds a lot of character. Stacey, I love the cart and it was fun seeing how you have mixed it up from year to year. The little tractor is so sweet! I love coal buckets and have a few of them. You know me, one will never do. lol! I think your garden is looking just beautiful! 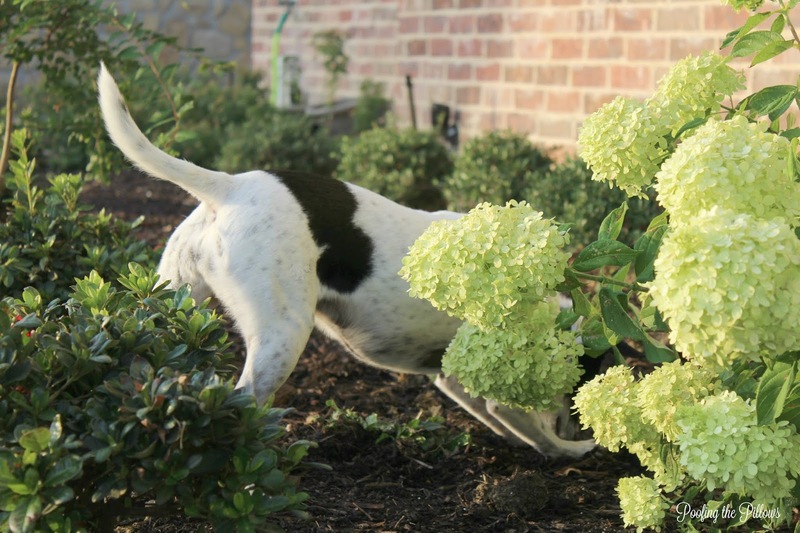 Stacey, you've got great character in your garden, whether it's plants, pup or pieces! I can see why you love the cart, so versatile. St. Francis is a personal favorite. And I can certainly relate to the backstory on sourcing the coal hood. My guy and your guy are two of the same when it comes to shopping. Here's hoping your young garden survives the test of the extreme temps in your region. I know it's added work, just babying it all. Oh, and Mrs. Powers? I'd almost be afraid to put her outside if I could afford her (even at barn sale pricing!). She sure is whimsical though. So cute! That cart makes me smile and all the Floral fun memories behind it! Ok the little tractor is too adorable and love the cart. Your garden delights are so wonderful. 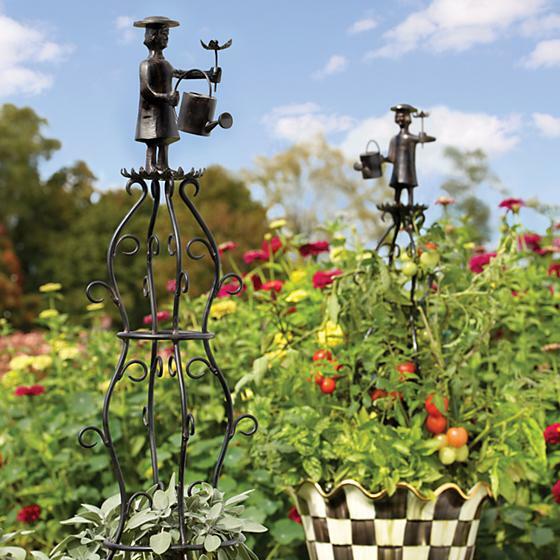 How fun and I love to add whimsy to my gardens too so this is a lot of fun to see all the inspiration. Have a great new week. Your enchanting fountain truly makes my heart happy! As a child we had the same tractor sprinkler. It came from the farm supply store. The backyard one was green and the front yard was yellow. I always look for them at estate sales but so far have come up empty handed. I agree that there is nothing like a little dog in the garden to make you smile. I saw some super cute things in your garden and now want them for myself! I don't know if that's how it's supposed to work but too bad! Especially the frog chasing dog! Gotta have him. Loved the tour! I'd trade items with you, Cindy! Or like I've said...let's go shopping! 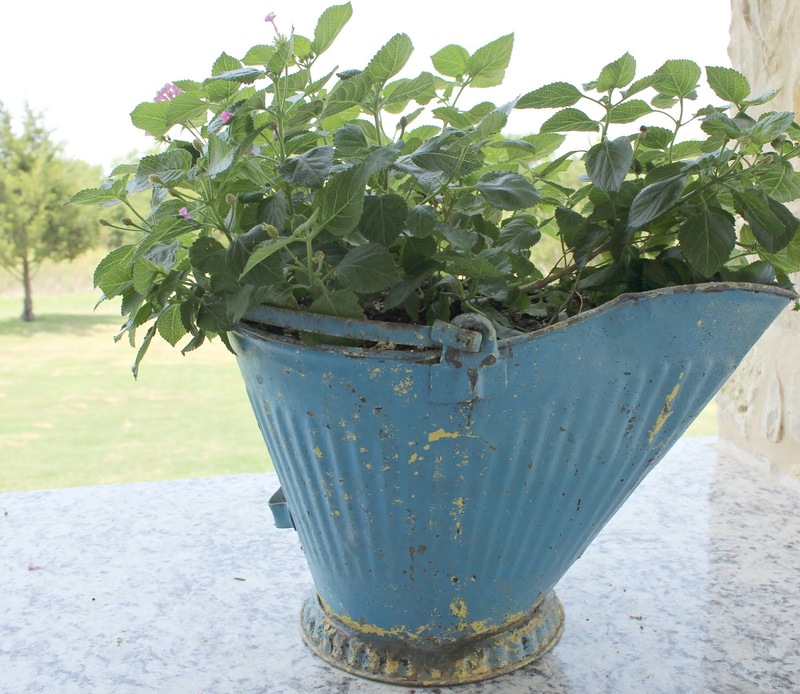 Your garden looks lovely, and the vintage blue coal bucket is my favorite! Hope your plants are faring better than mine in this prolonged triple digit heat. The yard guys were here today trimming large trees with dead limbs. We need some rain and relief from the soaring heat. Your pup is adorable in the garden chasing frogs. Beautiful post... love the memories and history you shared about your garden, Stacey! ;-) Pinned! Hi Stacey, oh you have such a pretty garden and I too love your cart and how you decorated it over the years. The other flowers and statues are really nice! Thanks for sharing your garden at Cooking and Crafting with J&J. Stacey, everything looks just beautiful! I would love to have a cart like that! You have styled it beautifully! 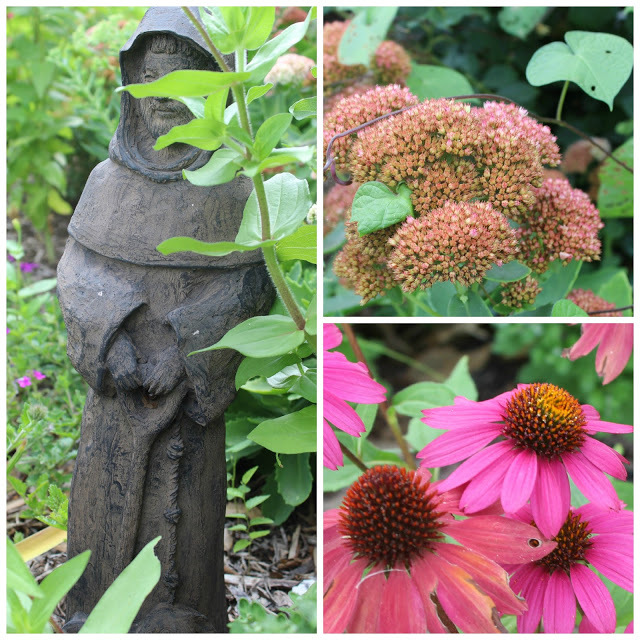 I love the St. Francis garden, and I can see why you would want to add the MacKenzie Child's piece to your collection! It is adorable and so is Belle! What a cutie! Enjoy your week! I love that cart! It is so fun to see how you've styled it over the years - I can see why you keep using it!! I've enjoyed seeing your garden spots. Love the coal bucket. I love your cart and all the different ways its been used, thanks for the tour. Thank you, Marlene. You are always so kind. I love that little cart of yours and look how sweet little Belle is enjoying the garden too! Love that! I have a trio of (fake) bunnies in my garden that we bought after a trip to Disney. I loved seeing the real bunnies frolicking around the castle and thought it would be a nice reminder of our vacation. Stay cool! You've given me so many neat ideas. We have a courtyard in the back of our house and it could use something special! Enjoy your week! I know it's HOT there...stay cool if you can! Hugs! Very sweet things in your garden! I love the cute back end of your Belle. What a great picture! Your gardens are just lovely! The cart is such a fun styling piece-I especially love it with the caladiums and leafy textures. And that groundcover around the cool tractor is awesome-love the bright green. Fun hopping with you again! Stacey, I love your garden, but I have to ask you what breed is your Belle? I saved a dog from our local SPCA. Her name is Noelle and she just turned 1 year old. They told me she was a Chihuahua mix. I think she is part Jack Russell Terrier because she's bigger than a Chihuahua and the shape of her ears. She looks just like Belle, but she's white and tan. Anyway, enjoyed your post! MaryJean, I hope you see this! I couldn't respond to your email. Belle was also a rescue dog from our local shelter. She's part Rat Terrier and part Chihuahua. She's the best of everything! We love her so much it's hard to believe. Stacey, it's lovely. Oh, sweet Belle! She must make you smile. And that garden cart is a gem, really lovely. I, too, have a coal scuttle that should get a remake. Thanks for the inspiration and the visit to the arboretum, too. I envy you that you can do that with your mom. I love that cart Stacey and enjoyed seeing the various ways you planted it. I’m after some kind of cart myself- perhaps a goats cart but haven’t found what I want yet. 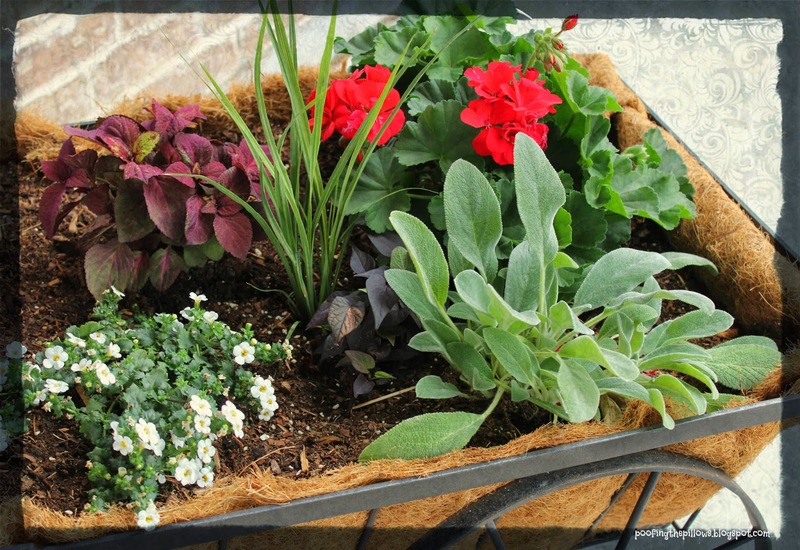 The coal bucket is a cute idea for planting. The old John Deere tractor is quite a treasure. One a year we have an old engine show nearby that we get to see the tractors that really look like this! I’ll send you a note about the ice plant. 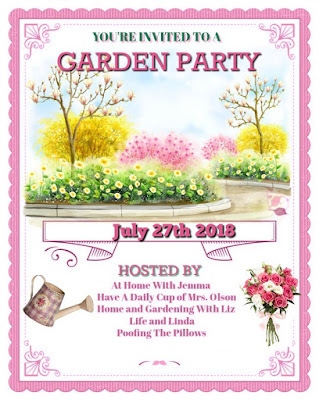 Looking forward to the Garden Party this Friday! 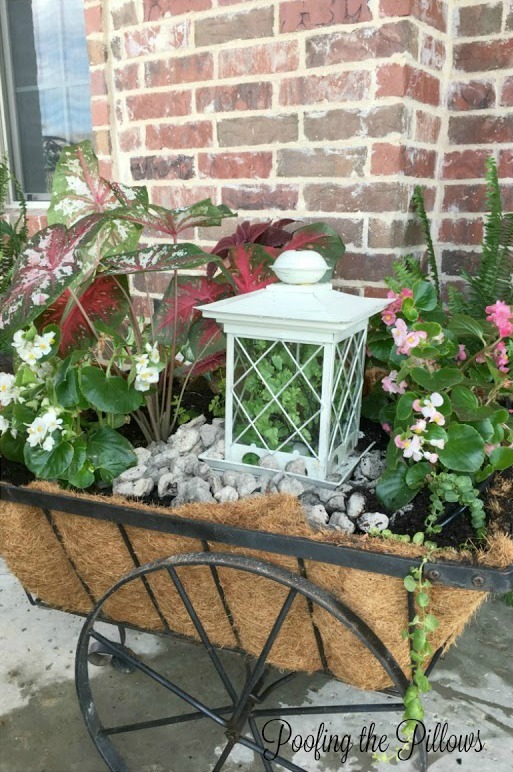 Your garden looks so pretty, Stacey, and I loved seeing how you incorporate different treasures among the plants and flowers. I hope you find your M-C art piece on sale sometime. Thanks for sharing the beauty with us. So wonderful Stacey!....and I hope Mrs. Powers goes on sale..she is a cutie!!! Your garden and garden treasures are just fabulous, but nothing beats your cute pup! Adorable!! Stacey, I love your garden and all the garden art. The blue coal bucket is darling and I hope Mrs. Powers goes on sale so you can quick grab her. Mr. Cottage isn't a shopper either, but he'll go with me to flea markets and antique stores and follow me around. Stacey, Your tour is so beautiful! I love seeing how you have used your pieces over the years. I really like that blue coal bucket. Was it blue when you found it? Love that color. The ice plant is such a gorgeous plant! Stacey, your garden is amazing. There's nothing like a dog to light up your world. I stopped reading when I saw that MacKenzie Childs piece. Every garden needs some MacKenzie Childs. Hi Stacey! Of course you know I love little garden statues... ;) I love yours and pinned a few photos along the way. <3 I like how you shared the coal hod and tractor and shared older photos from earlier ~ a nice touch. :) Enjoying wandering through the Garden Blog Hop!!! Love your vintage coal bucket!! I had one many years ago that I sold at a yard sale and of course, now that I am older and wiser I could kick myself for doing so!!! Thanks for sharing your charming garden!! I love the use of yard art or hard scapes in the garden. That adorable tractor is calling my name. I have never seen that but boy I wish I had. I would not be able to pass that gem up! So nice, love your garden decoration. Buy the way from where you buy the cart? Or where can build one for myself. Maria, I hope you see this! I was unable to respond to your email. We've had that cart since 2000! Can you believe it? I repaint it every few years and it looks like new again. I've seen many that are similar on Amazon. Stacy, your garden is lovely. I especially loved the blue coal bucket. Brought back many memories of my childhood. We burned coal in our fireplace and I used a coal bucket many times. I enjoyed my visit so much. Happy summer days and gardening! Stacey, I enjoyed my return visit. Thanks for linking at Gardens Galore! Stacey, I love adding vintage touches to our garden too. Mine are old bird baths, flower pots, and a some staturary. I hope you get Mrs. Powers. She is one of my recent purchases. She's been on back order for some time, but I'm happy to say she arrived a few weeks ago. I'm waiting to give her a coat of sealant befow she lives outside. I also haven't decided where she will reside. We hope to create a new courtlyard with a planned remodel, and I ordered her with that in mind. I would love the Mrs. Powers gate! Always dreaming! Your vintage pieces are all charming. The tractor is special as is that blue bucket! Love adding things that have a story. One of my birdbaths was an estate sale find. It once belonged to a friend's mother who grew up on a beautiful estate here in town. It's one of my favorite pieces.